J.J.P. was born on May 19th 1903 in High Barnet, Hertfordshire. His father, Henry George Parkes, was a civil servant at the Inland Revenue (as was his grandfather); his mother, Elizabeth Swain, was a housewife. In 1905, when John was only two years old, his father died of asthma, at the early age of forty. Thus John and his brother Matthew had a difficult childhood in the sense that his mother had to depend mainly on relatives in order to make ends meet. One consequence of this was that they moved house very frequently: five different homes in the space of thirteen years, all in the Bushey – Barnet area, sharing with various uncles and aunts. John went to a preparatory school at Cockfosters, then was tutored at home for two years by Dora Smith, a university-educated neighbour, because he was suffering from glandular health problems, after which he went to Bushey Manor School. John evidently had an early interest in all mechanical devices. There is a watercolour painted by him at the age of ten (in 1913) showing a submarine, an aeroplane and an airship, which he entitled “modern inventions in sea and air”. His first encounter with a real-life aeroplane took place around 1914 when a Bleriot Monoplane and a Longhorn Farman biplane landed at Bushey Hall Golf Course and he ran as fast as his legs could carry him to see them and their pilots, Gustav Hamel and Claude Graham White. He also remembered seeing a Schutte-Imz airship shot down at Coughley in September 1916. His father cultivated a number of scientific interests in his private life: he possessed a microscope, and constructed model locomotives and a sand-driven windmill, operated like a waterwheel. J.J.P. got his first job in 1917, at the age of 14, working for the London County Council for fifteen shillings a week. He was then taken on by a Mr. W.M. Joy (described by him as a “wild Irishman”) as a self-taught “ship’s engineer”, operating the diesel engine of a schooner on which Mr.Joy transported cars from England and the Continent to Ireland on behalf of an Irish car importer. This brought a rise in salary to six pounds a week. After he had been doing this job for about a year the car importer, Mr. Wilson, bought up the Angus Sanderson Company, which produced cars by assembling components made by a variety of small manufacturers. This provided the opportunity for John to embark on a student engineering apprenticeship with Angus Sanderson, based at Hendon. After a few years the company went into liquidation which led him to move on to another car manufacturer, Swift of Coventry Ltd., where he completed his apprenticeship in 1925 and subsequently became manager of the company’s London depot. In 1927 he moved again to work for the Rootes Group in Maidstone, which at that time was a car distributor. In the course of these years he had also learned to fly. In 1925 he heard about the formation of the Auxiliary Air Force, which immediately sparked his interest. By a stroke of luck, while working at Swift he met a Swift owner who was a Flight Lieutenant at the Central Air Force Staff and personal assistant to Lord Trenchard, Chief of the Air Staff. This fortuitous encounter led to an interview with Lord Grosvenor, who was in the process of setting up 601 Squadron, part of the Auxiliary Air Force then in course of formation. 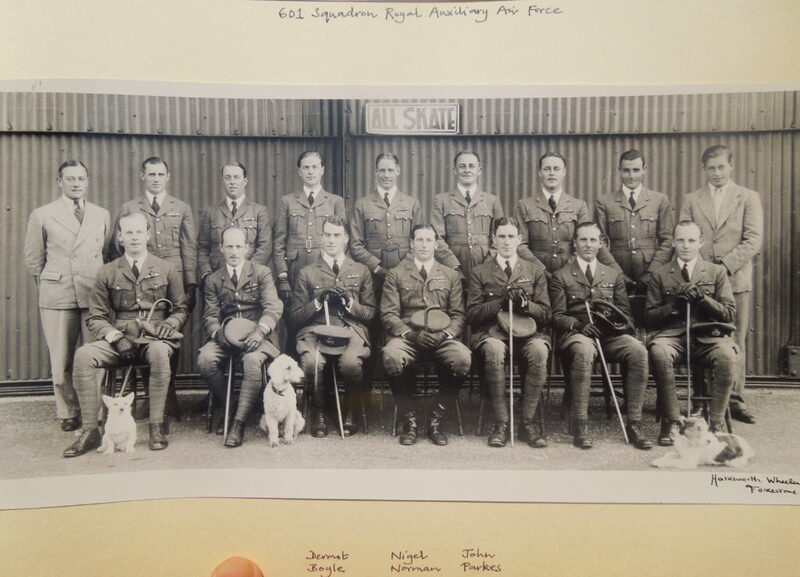 Lord Grosvenor evidently liked what he saw and John subsequently went to an official interview with the selection board and was accepted for entry to the squadron in 1925. At that time aspiring Auxiliary Air Force pilots had to gain a basic “A” flying licence at their own expense but the Air Ministry would then refund the applicant’s tuition expenses of ninety-six pounds, after which they received further tuition to bring them up to operational standard – quite an effective way of weeding out unsuitable candidates! In November 1925 John started learning to fly at the De Havilland School of Flying, based at Stag Lane airport. 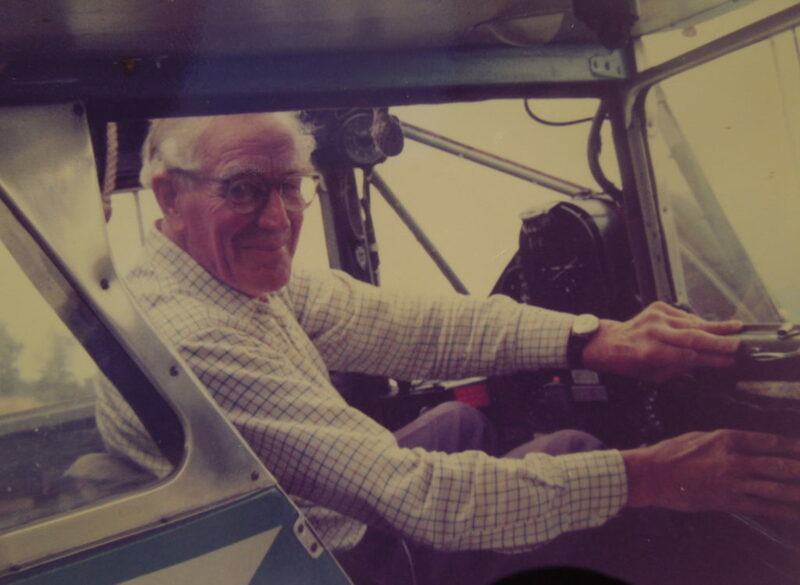 He was taught on two of the first De Havilland Moths ever made. In May 1926, after six months’ training, he gained his “A” Pilot’s Licence, and officially became an Auxiliary Air Force pilot. He was in fact the first Auxiliary Air Force pilot in the country to qualify by this route. Paying for those initial flying lessons must have been quite a sacrifice on the sort of salary he was getting at that time. In 1927 he gained his RAF “Wings” and a “B” commercial pilot’s licence, and in May of that year was officially authorized to wear the R.A.F. Pilot’s badge. Later, he was promoted to the rank of Flight Lieutenant. In 1929 he was posted to the Central Flying School in Hendon to do a full RAF Instructor’s course, the first Auxiliary to do so. All of this was achieved in his spare time, because he was still working at the Rootes Group. 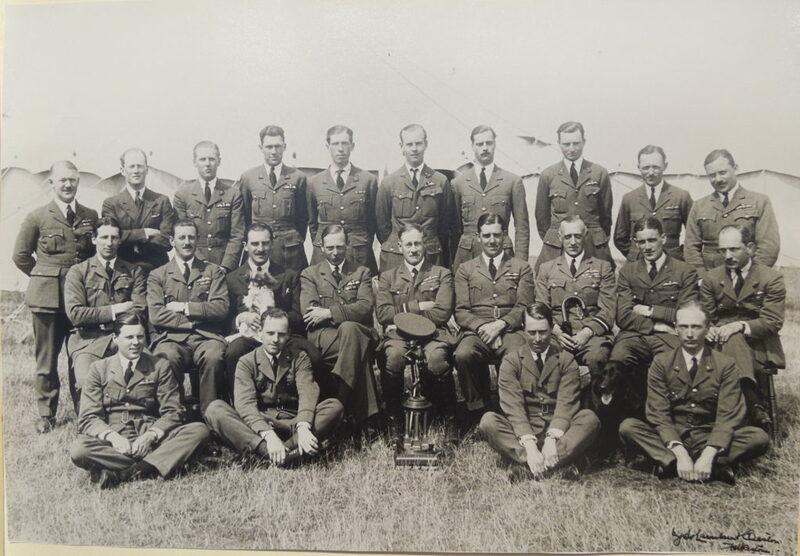 Most of the other pilots in 601 Squadron came from a very different background: Lord Grosvenor recruited his first group of officers from his friends at White’s Club. In general they were wealthy members of the upper class who were used to an expensive lifestyle and had the kind of security which comes from not having to worry about how you were going to survive in life. In their case paying for flying lessons was not a problem – in fact, quite a lot of them owned their own planes. Most of 601’s training took place at weekends during the year, but from 1926 onwards every year in the month of August they went for more intensive training at a summer camp at Lympne airport, where they also enjoyed the lavish hospitality of Sir Philip Sassoon, (who, after the death of Lord Grosvenor in 1929, became commanding officer of the Squadron) at his home in Port Lympne. Here they alternated serious flying training and exercises with elaborate practical jokes at the expense of rival squadrons which chiefly involved bombarding each other’s airfields with items such as rolls of lavatory paper, jerry cans, matchboxes full of tiny crabs, and suchlike. John remained a member of 601 Squadron up to the outbreak of World War II. In July 1938, on the extension of his service for four years, he applied to be transferred to from Class A to Class C of the A.A.F. Reserve, which meant that he was no longer required to carry out training. He was a member of the Squadron for about thirteen years in all, from 1926 to 1939. The flying qualifications and contacts John gained in the A.A.F. enabled him to move into the aviation industry, which had been his ambition right from his teenage years. In 1929 he left the Rootes Group and moved to Airwork Ltd., where he remained until 1936. These were perhaps the most exciting and adventurous years of his life. 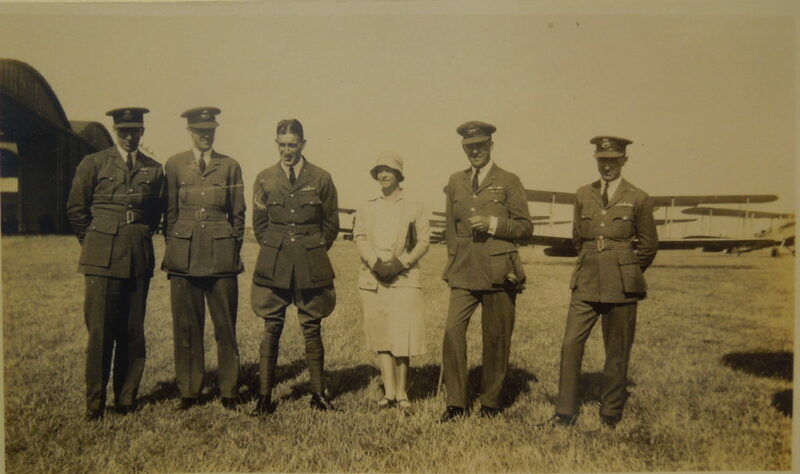 The Airwork Company was set up by Nigel Norman and Alan Muntz in 1928 for the purpose of constructing and operating the Heston Air Park (located near Hounslow in Middlesex); the Park was officially opened on 5 July 1929 to coincide with hosting the King’s Cup air race. Heston was the first UK airport to have a concrete hangar and concrete aprons, thus very modern for its time. 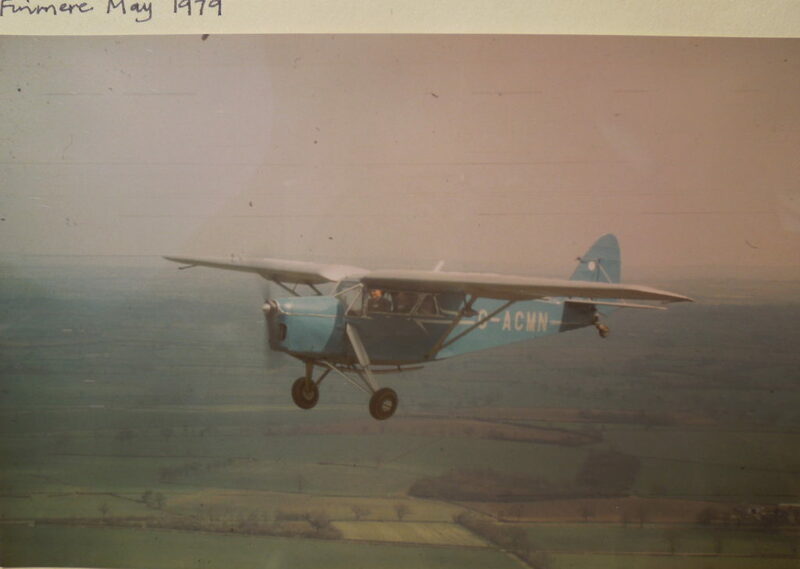 The Air Park’s activities included hosting and servicing privately owned aircraft, as well as acting as a base for the Guards Flying Club and the Old Etonian Flying Club, operating a Flying School, putting on aircraft displays and public demonstrations of new aircraft types, holding air races and “garden parties”, testing aircraft, and operating private charter flights. Quoting from Alan Muntz’s obituary: “Under Norman as Chairman and Muntz as Managing Director, Heston quickly came to be regarded as one of the best-run aerodromes in the country, with a relaxed but professional atmosphere allied to a social focus, forming one of the most fashionable out-of-town resorts of the day”. Sir Nigel Norman, one of the co-founders of the Heston Air Park, was also a member of 601 Squadron and became its commanding officer for a few years in the 1930s. Thus John’s career move to Airwork came about as a result of getting to know Norman in the Auxiliary Air Force context. His seven years there gave him experience of different aspects of civil aviation, including the manufacture, servicing and repair of aircraft. His role in the company included teaching people to fly, giving joy rides, doing demonstration flights, and flying as a charter pilot. He also did a lot of aircraft testing, particularly during the later years. Going through his flying log books for this period one gets a panorama these activities. Some of the entries are more dramatic: “crashed” (followed by no flying at all for six months from October 1929 to April 1930, because he had sustained a severe back injury), “engine cut out in mid-Channel, glided back to Hawkings”, “unable to land at aerodrome owing to it being covered in ground fog, landed in local field and motored in”, “en route to Barcelona – forced landed in field, engine cut”, “engine cut out owing to broken piston after taking off – landed on aerodrome”, “forced landing in stubble field en route, starboard tank failed to feed”. In 1929 most of the flights were to places in Southern England but from 1930 onwards they occasionally ranged further afield to places such as Antwerp, Le Bourget, Lyon, Cannes, Nice, and Dijon. He was flying virtually every day, mainly several short flights per day, and in the period from August 1928 to September 1936 clocked up a total of 1142.50 hours of civilian flying, as well as about 600 hours recorded in his RAF Log Books (which remained with the RAF). 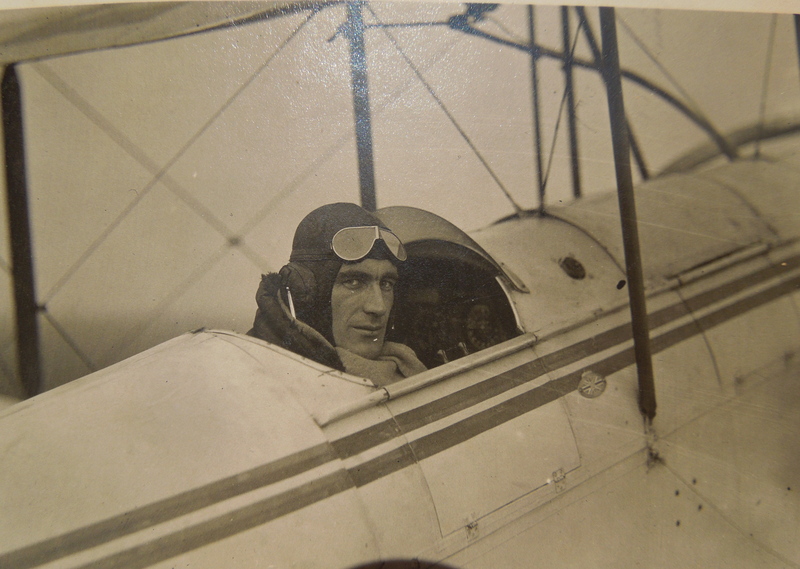 This experience offered him the chance to fly a great variety of aircraft, 81 different civil aircraft/engine types between 1929 and the end of 1935. In 1934 he found himself involved in a totally new venture. 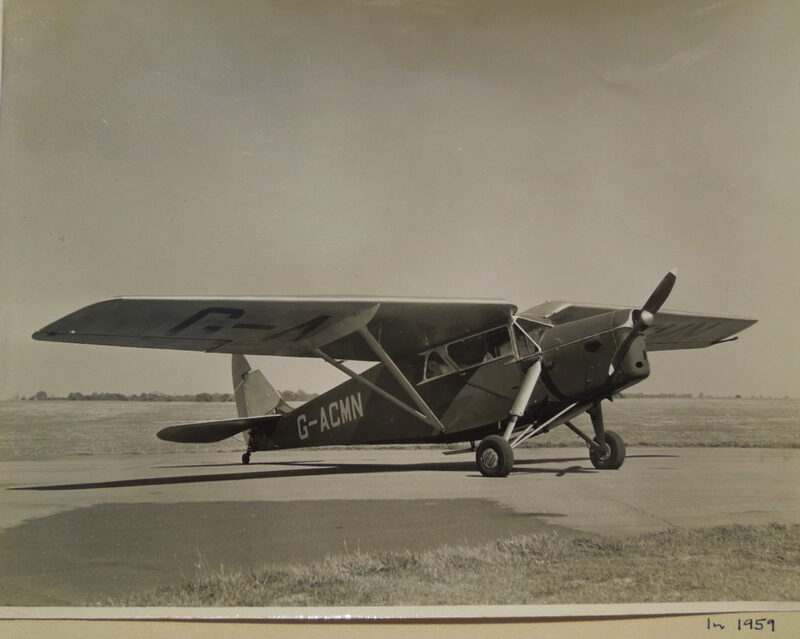 In the 1930s Alan Muntz, the Managing Director of Airwork, had embarked on creating separate companies to set up commercial air services in Egypt, Palestine, Persia and Iraq, under the technical direction of Airwork. As a result, in June and July 1934 J.J.P.’s logbook records a series of flights between Abadan, Tul-i-Bazuun, Teheran, Bahgdad, Rutlak, Gaza, Almaza (Cairo), and Haifa in Dragon and Moth aircraft. In December 1934 he took a Rapide aircraft from Heston to Teheran via Lyon, Marseilles, Tunis, Sirte, Bengazi, Almaza, and Baghdad. To give an idea of what this involved you have to remember that at that time pilots had to navigate by using a map and compass and identifying landmarks, such as railway lines, on the ground. Making sure you could fill up with fuel at the various stops could also be complicated and required advance planning. In Libia he could count on an unusual acquaintance: Maresciallo Italo Balbo, who in November 1933 had been nominated by Mussolini as Governor of Tripolitania. In the early 1930s Maresciallo Balbo, at that time Air Minister of Italy, flew to England with the chief test pilot of Breda in a prototype Breda 32, landing at Hatfield Airport. Balbo himself insisted on making the landing. After a smooth touch-down the aircraft started to execute a large ground loop to the left, demolished some boundary fencing, and toppled slowly into a drainage ditch. Nigel Norman and some others went out in a car. Balbo appeared, unhurt, at the door of the plane, and, in order to justify his débâcle, declared that: “Il faut toujours se méfier des freins francais” (You should never trust French brakes). The Italian Air Attache, Colonel Bitossi, confided that if Mussolini heard about this event and Balbo were unable to depart on schedule he could find himself in a very embarrassing situation on his return to Italy. The only serious damage was to one of the elevators. A replacement was flown over from Vickers at Weybridge and the plane was rapidly repaired. Balbo thanked Airwork fulsomely and presented them with an official letter offering help if they needed it at any future time. It so happened that on one of his Middle Eastern trips John had some engine trouble while in Libya and needed a mechanical repair. The Italian Air Force staff were very uncooperative until John produced the magic letter and, on seeing the signature of Maresciallo Balbo, they rapidly changed their tune and immediately set to work to fix the plane. 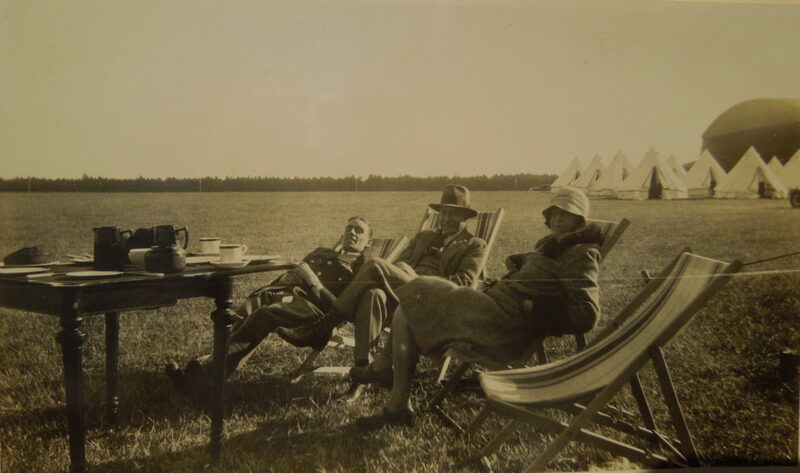 John remained in the Middle East until February 1935, mainly in order to fly the managers of the Anglo Persian Oil Company and the Iraq Petroleum Company from one area to another. At the end of these adventures John flew back to England, via Almaza, Benghazi, Sirte, Tripoli, Tunis (where he had to stop for several days having developed chicken pox), Catania, Naples, Rome, Sarzana, Lyon, Dijon, Orly, and Le Bourget. In those days any long journey had to be divided into many short hops. In June he made a further trip to Egypt with a DH86 plane, via Lyon, Rome, Brindisi and Athens. He had another story to tell about that trip. When he reached Rome he saw what he thought was the right airport and landed. Within a few minutes a group of armed soldiers came running towards the plane and he realized that he had mistakenly landed at the military airport instead of the civilian one. His reaction was to take off again straight away “without getting involved in an argument” and fly on southwards. 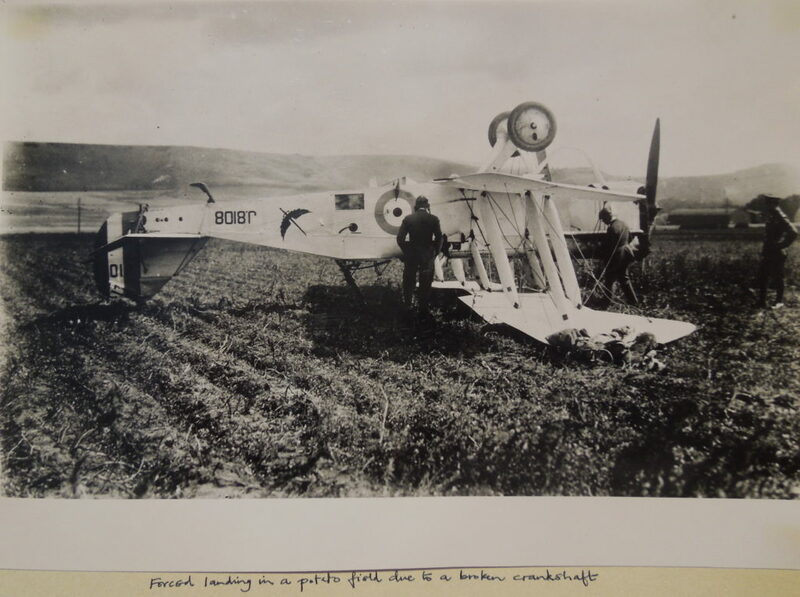 However, he needed to take on fuel before flying over the Mediterranean to North Africa, so ha landed again at Brindisi (hoping that the authorities there had not received a tip-off from Rome), refuelled as quickly as possible, and then left Italy without further complications. 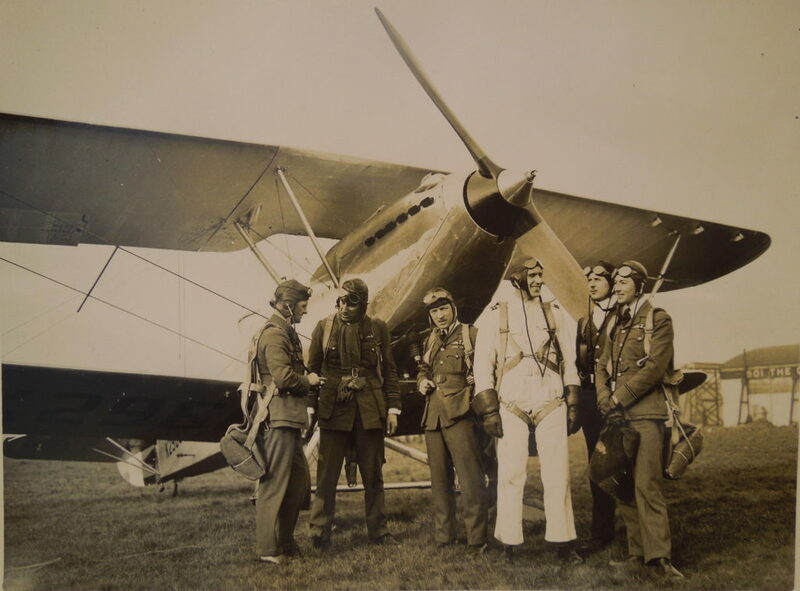 In Cairo he appears to have been training the English pilots based there to fly the DH86. In December 1935 he was again flying a Rapide in Iraq. On May 17th 1936 he had the opportunity to make a flight in the “Ernst Brandenburg” balloon, piloted by Herr Goetz, from Dusseldorf to Niederdorf. In the course of 1936 John left Airwork, having been appointed Assistant General Manager of the De Havilland Aircraft Company, where he remained throughout the Second World War, later becoming joint General Manager of the Engine and Airscrew Divisions. This career move to a managerial position was a major change from flying around the Middle East. His arrival coincided with the period in which the company was stepping up its production in response to the government’s policy of rearmament. At the end of 1936 he was transferred from the Hatfield factory to the original parent factory at Stag Lane to take charge of the manufacture of the thousands of Gypsy Major trainer engines needed to power the Tiger Moth trainer and other aircraft required by the RAF expansion programme. Simultaneously, the company was expanding its production of the Hamilton Standard Propeller under licence from the U.S.A. His specific responsibility was managing engine and propeller production at the Stag Lane and Lostock factories. Propeller production had started at the Stag Lane factory in July 1935 and in November 1937 the company embarked on building a second “shadow” propeller factory at Lostock near Bolton, Lancashire. In fact it was John who in 1936 identified the field in which the factory was subsequently built as a suitable site. Up to 1939 these factories produced propellers for both civilian and military use and before the war had even begun they had delivered 10,000 for 20 different aircraft types. In the run-up to the war all new RAF planes were fitted with De Havilland propellers. In the course of the war 77,029 propellers were produced by the Lostock factory and 23,210 at Lane. In addition, 37,801 propellers assembled from American components were made at Lostock. As production expanded to a network of shadow factories, John was in the end responsible for 15,000 workers in fifteen different factories. Many different types of propeller were made, to be fitted to over forty different types of aircraft. John assisted in the test flying of a variety of aircraft to provide improved performance in relation to propeller design. The propeller factories made a crucial contribution to the success of the RAF in the Battle of Britain. In early June 1940 test flights with constant-speed operation propellers (in which John took part) had shown that they could greatly improve the performance of the Spitfire and the Hurricane. In the period between June 25th and August 16th 1940 De Havilland worked flat out to convert 1,051 Spitfires and Hurricanes to constant speed propellers. This required both manufacturing and fitting the conversion sets at top speed – just in time to enable them to fight much more effectively against the Luftwaffe’s mass attacks on Channel ports and shipping. In February to March 1944 he made a two-month business trip to Canada and the USA on behalf of De Havilland, for the purpose of visiting propeller and aircraft engine factories (including their own factory in Canada), comparing their products and production with those of De Havilland, acquiring technical knowledge about new developments (such as jet engines), exploring the possibilities of collaboration in propeller and aircraft production, and talking to staff from the American and Canadian Air Forces. The trip involved a lot of travelling in the two countries, touching Ottawa, Toronto, Washington, New York, Hartford Conn., Milwaukee, Chicago, Los Angeles and Dayton and led him to form lasting friendships with a number of his Canadian and American colleagues. It is easy to imagine the management challenges which wartime production must have involved: rapidly scaling up production volumes, recruiting new staff, replacing skilled employees who left the company to join the Armed Forces, coordinating the work of the two main factories and the network of shadow factories, dealing with the disruption caused by air raids, maintaining staff morale, and incorporating continual technical changes in the production process. Executives worked a seven-day week, with a day off when advisable. 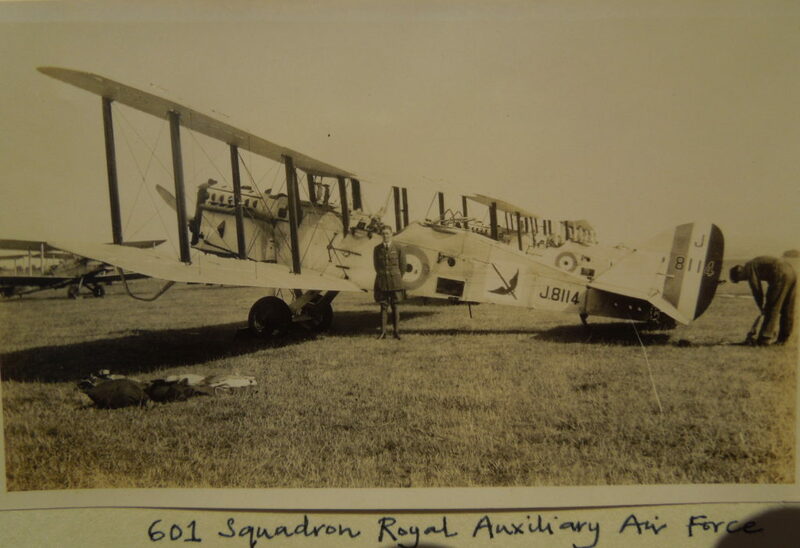 At the outbreak of the war 601 Squadron was incorporated in the R.A.F. but John, while retaining his commission as an R.A.F.officer, was not called up to fight because his role as a manager at an aircraft manufacturing company was thought to be more important. A number of his A.A.F. friends, including Nigel Norman and Roger Bushell, were killed fighting. After the war he continued to maintain friendships with various people he had known through the squadron, such as Loel Guiness, Bryan Thynne, Dickie Shaw, Christopher Clarkson, Max Aitken, Sir Dermot Boyle and Whitney Straight, as well as the sons of Nigel Norman, who became 601 pilots in the 1950s. He remained emotionally attached to the Squadron and participated in various commemorative events, such as the thirty-second annual dinner of the Old Comrades Association in March 1957, prior to the disbandment of the Squadron — the last such dinner to be held at the Town H.Q. in Kensington Park Road — at which he made a speech proposing the health of the guests. He proudly paraded in lounge suit and bowler hat when the squadron received a new Standard from Prince Philip in July 1954 and attended the celebrations for the 50th Anniversary of the formation of the Royal Auxiliary Air Force in October 1974. He remained a lifelong member of the R.A.F. Club and of the Aero Club which he visited regularly when in London, meeting his old friends. In December 1945 John left the De Havilland Company, having been offered a new job as Managing Director of the Alvis Company in Coventry. He had already had a lot of contact with Alvis because the company participated in the shadow factory scheme (by which the manufacture of munitions was dispersed to various locations for security reasons). In the course of the war it had supplied De Havilland with 19,084 variable pitch propeller hub assemblies and 137,647 spare parts for variable pitch propellers. At the time when he joined Alvis the company faced two challenges: converting to peacetime production, and getting back onto a sound financial footing – in the last years before the war it was making a loss. Initially it survived by taking on a variety of productive activities: manufacturing Leonides aircraft engines, the Alvis Fourteen car, Thomson British Auto Printing Presses, and bomb trolleys for use on aircraft carriers. It was also reconditioning pre-war Alvis cars (which had inevitably been mothballed during the war). The Board of Trade suggested that it might be interested in producing hosiery knitting machines and mechanical bookbinding equipment, but these options were rejected! Gradually the company’s new direction was defined. It came to specialize in three categories of product: luxury cars, armoured military vehicles, and aircraft engines. Manufacturing and selling luxury cars was fraught with difficulties: immediately after the War years supplies of steel were restricted and their allocation was controlled by the government; it was difficult to predict how big the luxury car market might be (especially in the early years when there were recurrent fuel crises); the costs of developing and putting into production a new model of car were extremely high in relation to the potential volume of sales; and it was difficult to maintain long-term contracts with independent bodybuilders, which were gradually bought up by other manufacturers. In the years between 1947 and 1967 Alvis bodies were built by four different coachwork companies: Mulliners, Graber of Berne, Willowbrook of Loughborough, and Park Ward. In 1952 Alec Issigonis (who later designed the Mini) joined the company and in the next three years designed an extremely innovative car of great technical merit; in the meantime the costs of new capital equipment and factory space had nearly doubled. As a result the project was reluctantly abandoned and in 1955 Alec Issigonis returned to B.M.C. In order to make a profit, it would have been necessary to produce and sell at least 10,000 cars per year, which Alvis was not equipped to do without a major injection of capital and expansion of its production facilities. In the years between 1946 and 1967 the company built 14,144 Alvis cars in all, an average of roughly 700 cars per year. The manufacture of armoured military vehicles turned out to be the company’s best long-term money-earner; in fact, it is what it still does today. In the 1930s Alvis had experimented with developing tanks, armoured vehicles and gun tractors, but none of them actually went into production. It also developed a bomb trailer, which was successful – over 10,000 were produced during the war. In the war years the company participated in the manufacture of a wide range of military equipment but this did not include tanks or armoured cars. In the late 1940s the directors decided to have another go at moving into the military vehicle market. By the end of 1949 a mock-up armoured car was presented to the army and gained a favourable reception; by 1950 Alvis had gained a major order for the Saracen armoured car. Over the years this was followed by a series of other military vehicles: the Salamander cross country fire tender, the Stalwart cross country amphibious load carrier, the Saladin armoured car, the Scorpion fire support vehicle and the Scimitar. In all 4,262 of these vehicles were produced, of which 1,629 were exported to twenty-three countries. In 1964 an agreement was signed with Automobiles M. Berliet of Lyon for the joint production of vehicles to be used by N.A.T.O. forces. The Leonides aero engine was produced with great success from 1946 to 1970. The design and development of a 450 bhp Leonides engine had actually started in 1937, but the project was shelved at the outbreak of the war. After the war development was resumed and by the end of 1945 a fully tested model was ready to be put into production. The engine was very successful, being used in the “Sealand” flying boat, the Westland “Dragonfly” and “Widgeon” helicopters, the Bristol “Sycamore” helicopter, the Percival “Prince”, “Provost”, and “Pembroke” aircraft, the Scottish Aviation “Prestwick Pioneer”, the De Havilland “Husky”, and the Saunders-Roe Hovercraft. In 1954 a more powerful 875 bhp engine, the Leonides Major, was brought out. It was adopted for the Westland “Whirlwind” helicopter. In the mid sixties the nine-cylinder Leonides was available in nine versions and the Leonides Major in three versions. It was installed in army and navy aircraft being operated by the Air Forces of the U.K., Australia, Belgium, Burma, Eire, France, Iraq, Italy, Rhodesia, Sweden and Thailand. By 1970, when the last Leonides was built, 2,300 engines had left the factory and in subsequent years aero engine servicing continued to generate a considerable volume of work. The various Leonides models were all piston-engined and the company was well aware that in time it would be necessary to switch to gas turbine engines. A large gas turbine engine was designed for the Bristol twin engined helicopter but in the end was not put into production; the incorporation of Alvis in British Leyland in 1967 led to the production of Rover Gas Turbines (a small gas turbine engine) in the Coventry factory under Alvis management from 1967 to 1973. In 1965 Alvis was merged with Rover and John joined the Rover Board. The rationale behind this development was that this would enable Alvis to continue to be involved in the production of luxury cars and would reduce its excessive dependence on military vehicles – by that time the production of Alvis cars and Leonides aero engines was declining. The production facilities and skills of the two companies were in fact similar and complementary. In 1967 both companies were absorbed into British Leyland (which eventually sold off Alvis to United Scientific Holdings in 1981). This succession of mergers was typical of the British motor industry in that period. From this brief account of the activities of the Alvis Company in the years in which it was managed by J.J.P. (he was made Chairman in 1949) it will be evident that maintaining its viability required a range of skills: diversifying its product range and activities, and concentrating on those which could command a market and were likely to be profitable; negotiating with the British military establishment, aeroplane and helicopter manufacturers, and foreign buyers of aircraft and armoured vehicles to achieve sales; adapting the company’s productive facilities to manufacture new products; training and managing a highly skilled workforce; and, towards the end, keeping the factory running at a time when the British motor industry was in decline and industrial unrest on the increase. Apparently J.J.P. was renowned for his severe cost control, especially in the immediate post-war period; soon after he took up his appointment the word on the shop floor was that his permission was necessary to buy a 1½ penny stamp! In 1954-55 and 1955-56 John was President of the Society of British Aircraft Constructors (the organization which runs the Farnborough Air Show), a measure of his standing and of the importance of the company within the aircraft industry. He also served as Vice-President of the Society of Motor Manufacturers and Traders. Throughout the years in which he managed Alvis as an independent company (1946 to 1965) it consistently made a profit. In his later years it depressed him to witness the decline of the British motor industry but at least in the end the Alvis Company survived, albeit no longer as a car manufacturer. During his time at Alvis and for a few years after retirement J.J.P. also served on the boards of various companies as a non-executive Director: he was a Director of the Cornhill Insurance Company, Vice Chairman of Birfield Ltd., Chairman of Salisbury Transmission Ltd. and Kent Alloys Ltd. and a director of the Rover Co. Ltd. and Rover Gas Turbines Ltd. He was also Chairman of the Export Council for the British Aerospace Industry and a member of the Ministry of Defence Scientific Advisory Council. 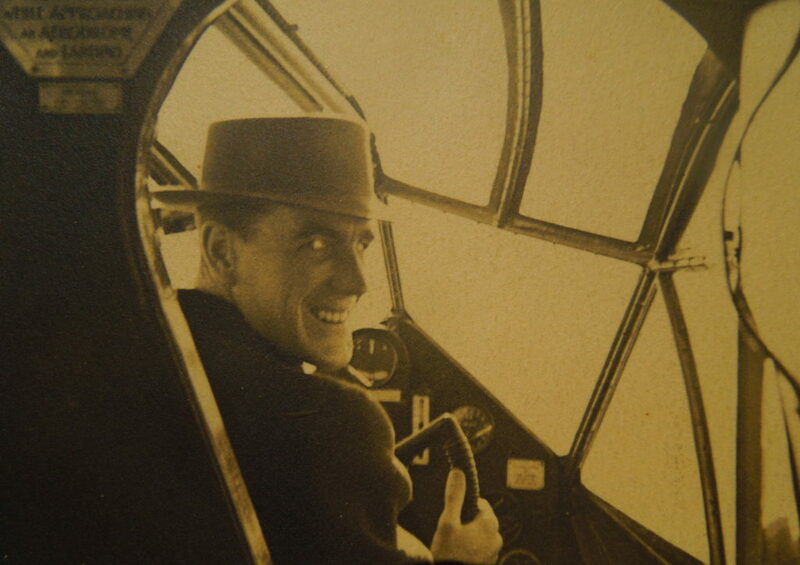 John continued to fly after World War II, but mainly for pleasure. After moving to Coventry to work at Alvis his flying base was Baginton Aerodrome, the home of the Coventry Flying Club. When he retired and moved to Suffolk in 1972 he flew from Martlesham Aerodrome, near Ipswich. 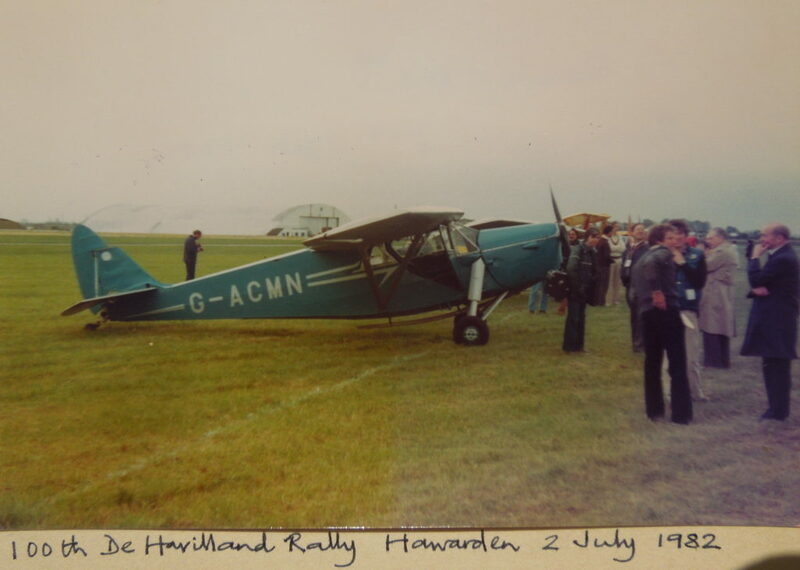 In 1957 he bought from De Havilland a renovated 1934 Leopard Moth (G-ACMN) which was his pride and joy; he kept it beautifully maintained and continued to fly it until the early 1980s. The grand total of his flying hours when he was finally obliged to give up due to heart problems was almost 3000 hours. He held a Private Pilot’s Licence for fifty-six years, from 1926 to 1982. Throughout the Fifties, Sixties and Seventies he attended aircraft rallies, flying there himself. 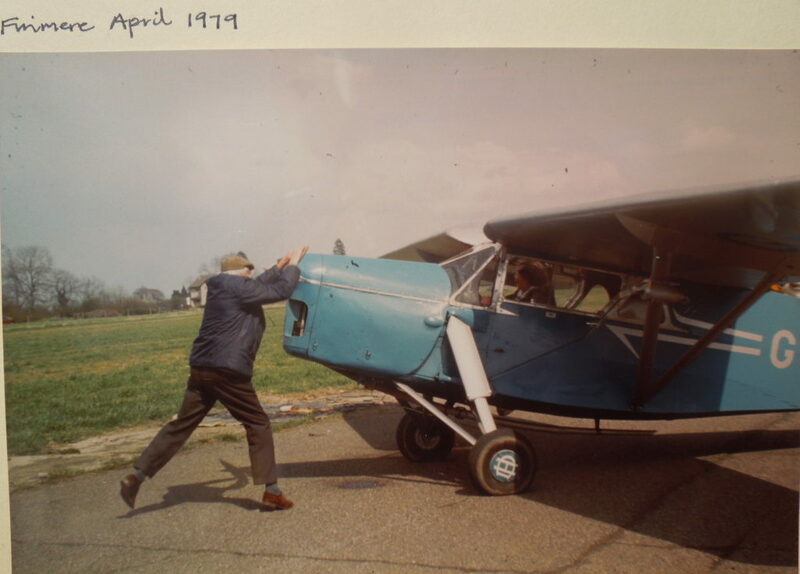 For many years he helped to run the Coventry Aeroplane Club, first as Chairman (1951-1965) and then as President (1965-1978). He had various other hobbies, which included amateur radio transmission, sailing, and game shooting. While living in Kenilworth, to improve his radio reception he built a thirty-foot radio antenna in the garden (which his children always wanted to climb). He never went in for ball sports, because he was not particularly good at them, but was a dab hand at croquet, competing ferociously in the annual tournament held by the London Alvis distributor, Bill Bates. In his later years he dedicated considerable time to serving on voluntary organizations: these included the Order of St. John of Jerusalem, the League of Friends of the Central Hospital and Leigh House, the Board of Governors of the Kingsley School, and the Parish Council of Charsfield, Suffolk, as well as the Coventry Aeroplane Club. His professional qualifications and decorations included a CBE (Commander of the British Empire) awarded in 1969 for services to export, the Air Efficiency Award (given from 1942 onwards for ten years’ efficient service in the Reserve Air Forces of the United Kingdom), Fellow of the Royal Aeronautical Society, Officer of the Order of St. John of Jerusalem (a charitable foundation which runs the St. John Ambulance Service and the St. John Eye Hospitals, as well as other medical activities), and Chartered Engineer. John married his first wife, Mary Beatrice Johnson in 1930. They had three children, Michael, Annabel and John. Mary died of cancer at the age of fifty in 1956 and in 1958 he married Jeanette Steencamp, a South African. Both his sons learned to fly and Michael also owned an aeroplane, a Beechcraft Baron. 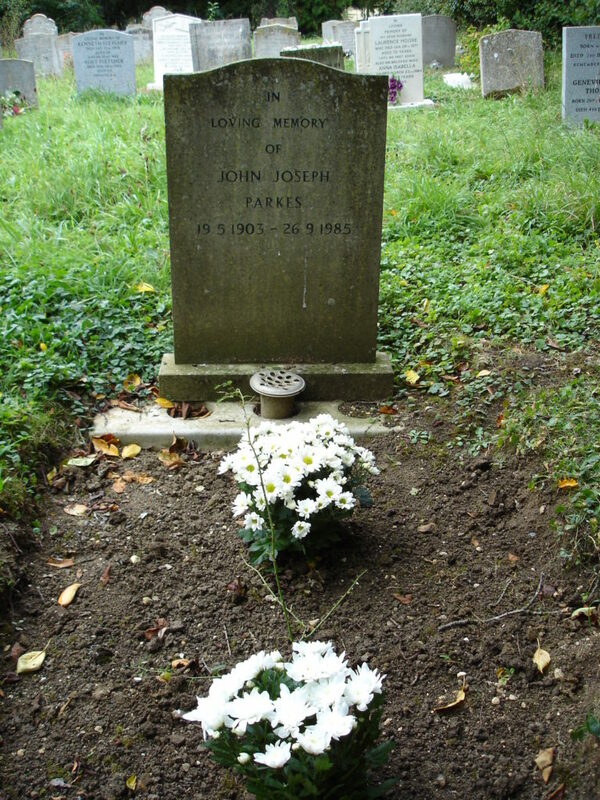 John died in 1985 at the age of 82 and is survived by his younger son and daughter. His elder son, Michael, was killed in a car accident in Italy in 1977. John’s grave is in the churchyard of Charsfield, Suffolk. Group photo Lympne C.O. Lord Grosvenor. JJP is first on left in standing row. Group photo Lympne “All Skate” C.O. Nigel Norman. JJP is third from right in seated row. Group photo Lympne with trophy C.O. Richard Shaw. JJP is second from right in middle row seated on chairs. Lympne. 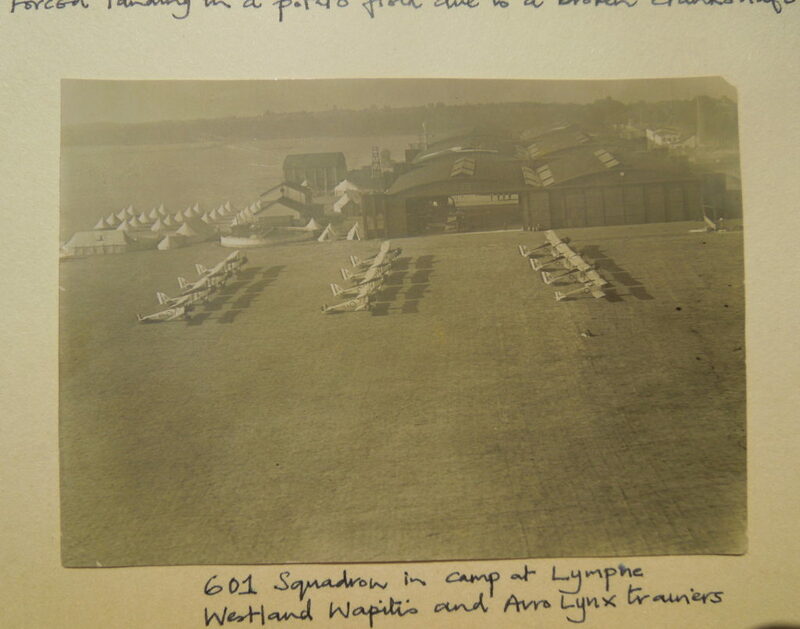 Tents and parked planes — Westland Wapitis and Avro Lynx trainers.